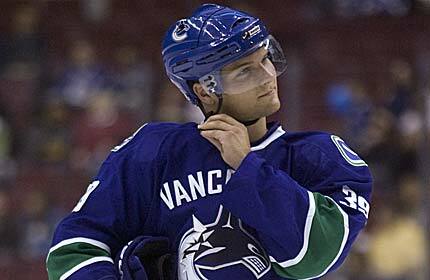 It's been a couple of years in the making for Vancouver Canucks fans, but Cody Hodgson appears poised to crack the Canucks line up this week, perhaps against the Dallas Stars. Hodgson has 10 goals and 16 points in 28 games with Manitoba this season and recently returned last week after missing six weeks with a broken orbital bone from taking a teammate's stick to the face in practice. Hodgson has overcome many injuries and long recoveries over the past couple of years. In an interview with Canucks.com, Hodgson suggests he'll skate on a line with Jeff Tambellini and Tanner Glass. Hodgson's call up comes at an interesting time and creates some questions about the current roster. Are GM Mike Gillis and coach Alain Vigneault happy with their secondary scoring? Mason Raymond, Mikael Samuelsson, and Alex Burrows have all had trouble finding the net lately, as have the likes of Raffi Torres and Manny Malhotra. While it's unlikely the Canucks would remove current roster players by the trading deadline, it is curious to see him up. If he's not up to help the team score, perhaps he's being auditioned or showcased in a potential move to augment the Canucks lineup at the trade deadline? Using an offensive-minded prospect on the fourth line may not be showcasing his talents in the most positive light, so either that theory is off, or Hodgon may seem time as a winger alongside Ryan Kesler in place of Sameulsson, Raymond or Tambellini. Either way, the Canucks are in a luxurious position with such a large lead over their division rival - the Colorado Avalanche. The Canucks may be providing their youth with experience at this point in the season to rest their veterans and give their youth some seasoning in case they are called upon due to injury later in the year. For Hodgson though, he probably doesn't care why he's there - he's just happy to get his shot after a rough couple of seasons. Hodgson is perhaps the most highly-touted Canucks prospect since the Sedin twins. Hodgson was a star of the IIHF World Junior Hockey tournament a couple of years back and was the OHL player of the year over the #1 overall pick of the New York Islanders John Tavares. What do you think? Is Hodgson in Vancouver to increase secondary scoring? Is he being showcased? Who could you even trade him for? a Good young blueliner if they can't re-sign Ehrhoff and Bieksa?